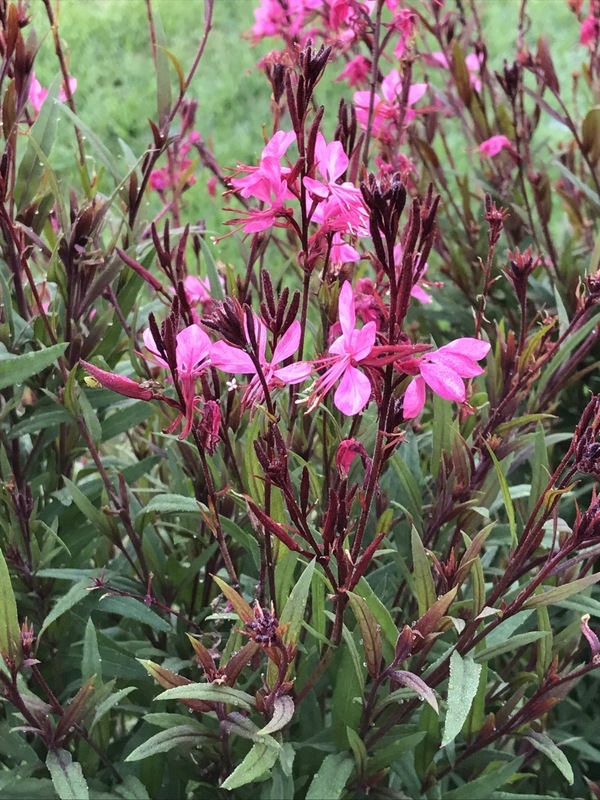 There are so many plants around at the moment that is it very hard to choose one plant for plant of the week but this is one of my favourite spring flowering plants. 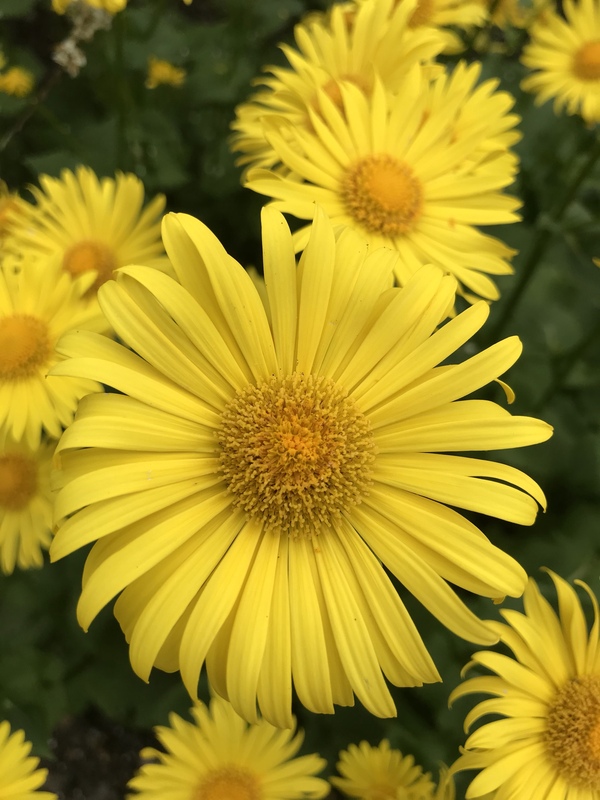 Doronicum ‘Miss Mason’ Is a small low growing plant, not getting much taller than 40cm tall here in the uk and the clumps don’t get much wider than that. It will grow in most soils and conditions, although it does prefer the soil to be slightly damp and moisture retentive, normally in full sun or semi shade . That said I have grown it on al types of soils from sandy, free draining to thin clay soils to clay soils. The only thing I have noticed is that the foliage tends to disappear quicker in the late summer if it drys out too much or indeed the weather gets too hot. That’s well worth remembering if you are planting it out in the borders. Doronicum ‘Miss Mason’ is an old garden hybrid that’s been around for years, it is possibly a hybrid of D.austriacum or D.causcasicum but again no one is sure. It is easy to propagate both from seed and also by division. Division is best done in the early autumn months, so the plant has time to reestablish itself before flowering in the spring. Well it’s Saturday and time for the great meme, 6 on Saturday! The last couple of weeks of rain (many thanks to the kids breaking up, we needed this rain!) the gardens have changed from dust beds back into our lush normal English gardens. It’s made it easy to get my 6 on Saturday this week! Pennisetum glaucum ‘Purple Majesty’ or purple millet, was one plant I have seen used so well in summer pot displays and always wanted to try it at home, managed to get hold of a plant this year and really loving the effect it is having near my front door, it’s giving me the height and stunning colour I wanted! Ahh Gazinias, you either love or hate them, I kinda of love them. This one was a bargain! Waitrose had a pot reduced down to £1 from £4 so picked up a pot and found I had 2 in there, divided up and added to my pots near the front door. Just love the bright colours and so do the bees! Rosa ‘Blushing Lucy’ well now she has finished flowering, it was time to prune it, to get the best flowers off it next year, nice easy job to do and one I love doing! All the nice new growths are tied in. This week my new wire has arrived and I can add the next one up I am missing. Another job to get done! 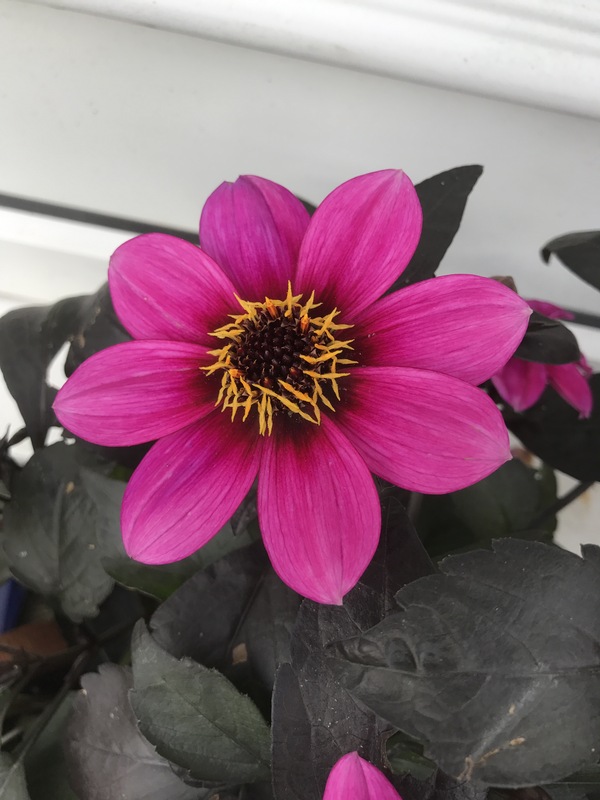 Well after a few weeks break with the Rose of the week, we are back to the plant of the week but with a slight difference. For the next month it’s The Butterfly count. This is carried out each year by the Butterfly conservation to monitor the more common types of butterflies we see in our gardens. So to celebrate this, for the next month I will be focusing on plants that are looking great at this time of year but also attract in butterflies. To start this off, it has to be the Butterfly Bush, Buddleja. There are so many great forms of great plant (check back in a few weeks for a more indepth look) but I have chosen my favourite form and also one of the darkest forms of Buddleja, Black Knight. Buddleja davidii is a native of Central and west China, were it grows up to 8000ft above seas level, where it can grow in some pretty poor soils, hence the reason it selfseeds and grows in any space in the uk, whether it’s a bit of waste ground, roof top or sides of a quarry. Sadly this ability has labelled it as a invasive plant. It was introduced into Europe by the French missionary Father David (hence davidii) from east Tibet in 1869. Buddleja itself was named of the British amateur Reverend Adam Buddleja by Von Linne in 1737. The form ‘Black Knight’ was bred by the famous Moerheim nursery in Holland by Ruys. It has become the most popular form of Buddleja to be grown mainly due to is stunning flowers that are the darkest form of any Buddleja. 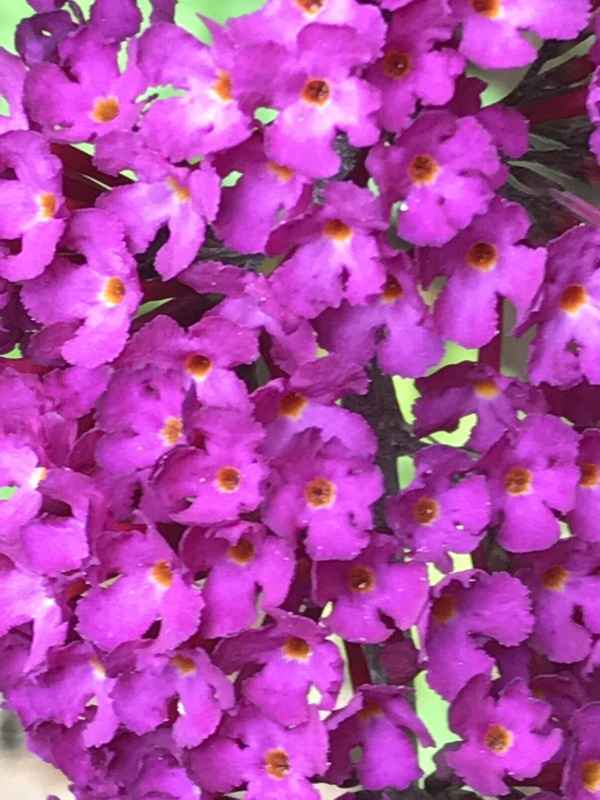 The flowers funny enough are smaller than the normal size of Buddleja flowers by are bourne on plants that will quite happily make 4m in height. It was grow away in most forms of soil, although it will struggle on heavy waterlogged ones. It is pretty pest and disease free apart from the horrible eel worm. They are a microscopic nematodes that live in the young shoots of leaves of the plant, they tend to cause yellow patches in the leaves and deformed growth on the tips of new growth. To check if it has it, cut an infected shoot up and place into a glass of water and leaves for 30 minutes, if they are present, you will see tiny little balls of these tiny tiny worms at the bottom of the glass. To treat, best way is to remove infected shoots during the growing season and all old leaves in the winter and burn. 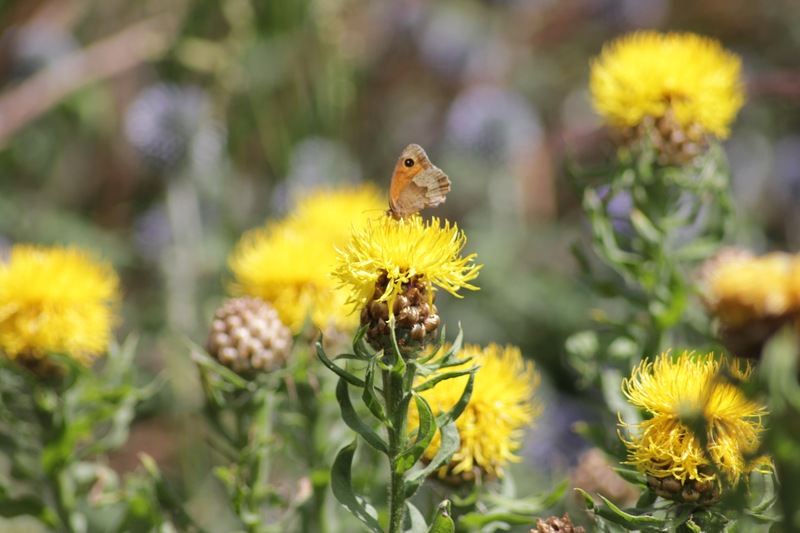 Butterflies make such a difference to our gardens, they make our gardens come a live with flicks of colour as they move around the garden, from one flower to the next, it helps to remind us our gardens aren’t just for our enjoyment but for the wildlife as well. 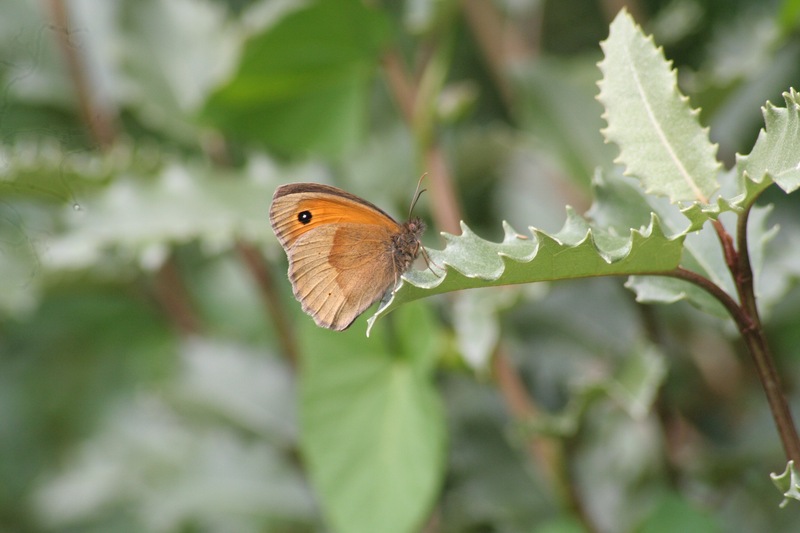 One great way to engage with the nature that’s flutters into our gardens is to take part in the Butterfly Count. The last few years at this time of year, the Butterfly Conservation charity launches its annual butterfly count. The count looks at the more common butterflies that fly around the uk, so they can monitor how they are doing and also help monitor the effect climate change is effecting one of the major indicators speices of change. This wonderful project has been going since 2010 and last year had a massive 36,000 people taking part, recording over 400,000 butterflies and dayflying moths. It takes place from 14th of July to 6th of August and it’s not a differiclt thing to do, doesn’t make if you don’t know any of the butterflies that are around you, they produce a great app for your phone or will send you a butterfly chart with all the speices on the monitoring list so you can fill out the survey nice and easy. It takes 15 minutes to carry out, and you can either sit down and watch on spot or walk around the garden counting them as you go. It’s brilliant fun to get the kids involved, my little 5yr old daughter loved helping me carry out a few with me last year and still talks about it even now. It really gets the kids into thinking about both the garden and our wildlife. I also use it to check I am doing my job right in the borders I develop with butterflies in mind, a 15 minute survey helps me to keep on top of the plants that are working better than others and plants certain type of butterflies enjoy feeding on! The Butterfly conservation does wonderful work promoting butterfly conservation around the country, improving habitats to help some of our rarest butterflies, monitoring so many diferent speices, improving our knowledge of butterflies, managing 30 sites and offering advice to other groups on improving sites. This is just a small part of what they do! It’s so easy to do, please take 15 minutes out of your week, whether it’s your lunchtime, spare time or even a whole school class or even take a picnic or daytime BBQ somewhere and add it into a fun game, all you need to do is download the app and take part of in it and open your eyes to the beauty of butterflies. While the Butterfly count is on, I am changing my plant of the week to my butterfly plant of the week, looking at a great plants, either cultivated or wild, that attractin butterflies either as a food source for catapilliers or indeed for the adults, hopefully this will encourage you in growing some more plants that help our beautiful winged delights. One of the joys of my job has to be when clients let me loose with the pencil, colouring pencils and Shoots excellent plant directory to redesign gardens, borders or indeed just add plants and colour to the garden. I love to choose plants that not only look good but also help to encourage more pollinators including bees and butterflies into the garden. But why try to encourage them to the garden in the first place? well apart from the pollinating aspect there’s also a beauty aspect of seeing these beautiful creatures flying around the garden adding colour, movement and sound to enhancing what you have already. These little creatures are already under pressure and us gardeners adding plants they love, will also help them survive, indeed a good garden will at times hold a wider range of insects than most other spaces. One thing to bare in mind when looking to add plants for pollinators into the garden is to provide a wide range of different plants with different size and shape of flowers, each different speices of insect have tongues of different lengths which then require plants with the nectar at different lengths. Also some plants can be more attractive to certain speices of butterflies, I have seen this happen with a couple of plants now, first one was with silver washed fritillaries, to see a couple in a day is a delight but on a group of Lysimachia clethroides, I counted 15! It’s happened every year since, not see them on any other plant within the garden. Saw a similar thing with Red Admirals and Eryngium agavifolium, they seem to prefer this to other plants in the area. Nepeta ‘Amelia’ a rather lovely pink version that gets up to 40cm in height and flowers all summer long, with its flowers attracting all types of pollinating insects. Nepeta x fassinii, a lovely hybrid catmint between N.racemosa and N.mussinii. It is a smaller plant measuring up to 30cm in height, a lovely blue colour that is at home on poor soils including shallow chalk soil. Helenium ‘MoreheimBeauty‘ another late summer flowering plant that can be seen buzzing with bees, butterflies and hoverflies. This North American plant will grow in most conditions but are more at in a damping bed. May need a little bit of support during the summer . Digitalis purpurea this biannual is a native of the British Isles where it can make a plant up to 2m in height, tends to flower early summer and is a great favourite of bees. Eupatorium maculatum this tall North American plant prefers to grow in a damp site, where it grows to 2m in height, again its open flowers again attract so many insects. Pulmonaria the lungworts are a real boast for any early season insects, these beautiful plants not only have lovely flowers but the leaves are also very beautiful, they do prefer a damp shady spot. They come in a wide range of pastel colours and tend to flower from February to April. These are just a tiny selection of plants that you can add to your borders to add both colour, interest and help our under pressure pollinators. Garden centres are now helping out by adding little pictures of bees to the labels. There are a few great groups to join if you want to learn more about bees and butterflies. They are the bumblebee conservation trust www.bumblebeeconservation.org and butterfly conservation www. Butterfly-conservation.org, These are great trusts to join to learn more about the bees and butterflies.